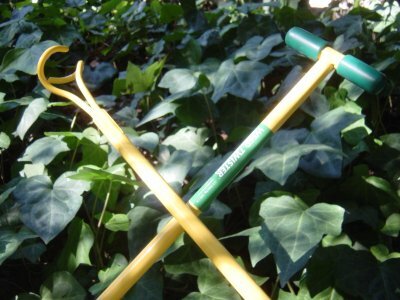 What types of Weeding Tools, Weed Pullers, Weed Poppers, Weed Twisters, Weed Hoes or other Garden Weeders do You Need? Special Weed Problems in your State or Region? How Big are your Weeds? Match your tools with the most troublesome weeds in your garden or state... Need a Back-Saving Solution? How many different Weed Twister Tools, Weed Augers, Weed Spinners are there? How to select a matching drill (not free!) for garden augers and twisters? Weed twisting-spinning tools are very popular today and differ either by name, design and / or the way they actually work. Several precise weed twisters are now on the market, two with the same name of "weed twister", some that are power-drill driven or motorized, an auger root remover, a corkscrew weeder, weed spinner, spinning tools, and other hybrid types described below. 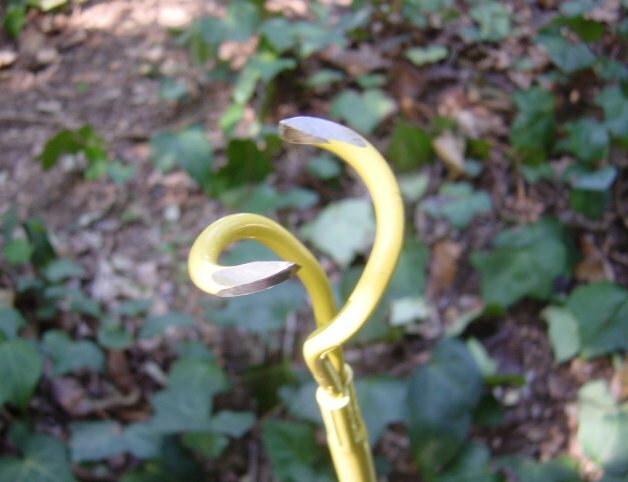 The Ergonica WEED TWISTER has double-coiled tines like two entwined corkscrews that provide for efficient penetration of the soil and effective loosening and lifting of the target roots. This is a patented design unique to the Ergonica Weed Twister. The incomparable versatility of this tool and multitasking capability is evident when studying the Weeding Tool Terrain Hierarchy. This twister is able to penetrate deeper into tough soil than other competing twisters and pullers. Built with tough steel for industrial use in farms and forest land management, the no-moving-parts simplicity of this patented tool allows for lighter weight than other twisters and pullers of similar length. The drill-powered Turbo Weed Twister by Ergonica gives you more speed and ease. This is the only twister that can also be applied to precise tilling as well as deep root extraction. 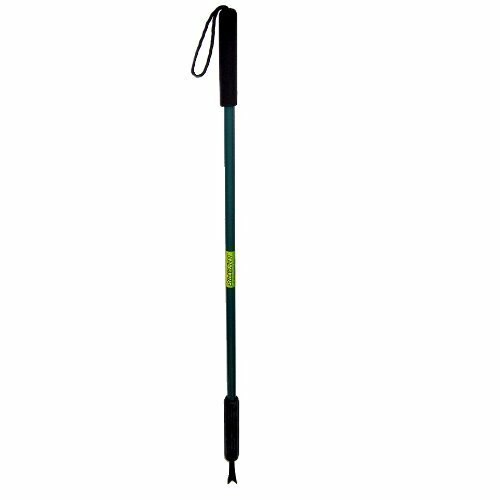 For trail maintenance and conservation, this tool serves not only as a heavy duty deep root extractor, but the manual models also double as a great walking staff and additionally as protection against predatory critters. A recent innovation is a T-Handle Adaptor that allows you to use the drill-powered Weed Twister manually if your battery runs low, for example. The Rittenhouse weed twister has a single triangular blade that must be twisted against the flat surface for penetration. A lever is provided to use your foot to push the blade into the roots. The Ergonica tool does not require the use of your foot to push the coils into the roots because of the efficient double-coil design. The required foot application of the Rittenhouse tool also limits the reach of the tool when used in flower beds or hillsides, for example. This limitation applies to all tools that require foot action to operate. A third "weed twister" by Hastings is no longer available on the market. Weed Queen is almost identical to the Rittenhouse weed twister, as described above, and is presented at weedqueen.com. Apparently, neither the weed queen nor the Rittenhouse weed twister have patent claims. If they did, there would be some serious contentions of violations of intellectual property. Pricing of the weed queen is lower than the Rittenhouse weed twister, however the manufacturers of the weed queen do not publish specific dimensions to enable a technical comparison between the two look-alikes. The limitations of the weed queen are identical to those of the Rittenhouse weed twister, assuming the dimensions are similar. A cork screw weeder by Dewit has a single coil or corkscrew that comes in two lengths: about 30 cm and a long handle model of 90 cm. The coil is 5 inches in length with a precise diameter of 1.5 inches. The double coil design of the Ergonica Weed Twister is designed to function like a fork in order to grab the roots at the apex of the two twisted tines. Without the forked apex, a single corkscrew lacks a mechanism to grab and efficiently remove the root once entwined, therefore, more work is required to screw the single corkscrew deeply into the root system. The forked coils also enable the Ergonica Weed Twister to serve as a precise cultivator, which functionality does not apply to the single corkscrew tool. See video of corkscrew weeder. An IWF Weed Extractor by Wolf-Garten features a single 6-inch prong with two blades that are shaped like shark fins on one side. The D-handle supports twisting against the flat side of the blades which design may cause considerable resistance depending on soil type and condition. The 36-inch handle qualifies for the long-handle class, but the ergonomic value is compromised somewhat by a heavy 4 pound weight, which is nearly three times heavier than the 36-inch Ergonica Weed Twister, for example. Even the 54-inch Dual Grip Weed Twister weighs a pound less than this shark-fin twister. The straight prong with parallel blades allows this tool to go deep, but the only way to penetrate the soil is to push straight and hard with the D-handle. You can view this tool and others by clicking the links in the Weeder Features Chart below. The Chaselink Speedy Weedy is a hybrid twisting tool with three straight prongs and an ejecting mechanism. Like other multiple-prong tools, the effective depth of penetration is limited by the length of the prongs. A "T" handle at the top of the 39-inch shaft helps you rotate the tool against the straight tines to engage the roots prior to lifting up. The removed roots are ejected by pushing down on the spring loaded plunger. The difference between this multi-prong tool and others by Fiskars and Hound Dog is that the prongs do not include a mechanism for clamping the roots between them. The twisting motion is therefore needed to entwine the roots between the prongs. Twisting straight tines is not as efficient as twisting coiled tines as those featured by the Ergonica Weed Twister. This tool is available both in the US and UK and is listed in Garden Tools and the Weeder Features Chart below. A Turf-Tec WeedAway is another hybrid twister much like the Chaselink Speedy Weedy and also contains an ejection rod to remove the weed from the tool after popping the weed out of the ground. The Turf-Tec WeedAway tool uses three 1/4 inch steel spikes to twist weeds from turfgrass areas without bending over and is designed to be a really heavy duty weed removal tool designed for the rugged maintenance of everyday use. It also has a heavy duty price tag at the 3-digit level. Although the length of both the Speedy Weedy and the WeedAway are the same 39 inches, the heavy duty steel construction of the Turf-Tec tool is most likely noticeable when comparing its weight against that of the aluminum built Speedy Weedy. Even though their weights are not specified, these tools most likely weigh twice or thrice the weight of an Ergonica Weed Twister of comparable length. Their ability to seek and destroy deep roots is also limited by the length of their spikes. The Turf-Tec WeedAway is also listed in the Weeder Features Chart below. The WeeDigger or Weed Digger from Flexrake features a fork with two straight tines each with a sharp hook. Apply by push, twist and pull with either a 9-inch or 36-inch wooden handle. Whereas most twisting tools feature a "T" handle or "D" handle, this tool has only a straight wooden pole with no special grip or handle for twisting. Twisting with straight tines also is less efficient than twisting with coiled tines, like those featured by the Ergonica Weed Twister. The length of the tines also limits the depth of penetration. This tool is not offered for sale directly online but may be found in some hardware stores which distribute Flexrake or Hula-Ho products. Other twisters include a garden claw tool on the market that is applied by twisting, but this tool is actually a cultivator designed to till a much larger diameter area than the other twisting tools and cannot grab and lift individual weeds. If you're looking into a hand tool for industrial or agricultural applications, several alternatives are also compared on the Hand Weeder Science page. The Ergonica Weed Twister also provides several models with lengths from 36 inches up to 60 inches. This feature, not offered by other twisters, allows you to select the best match for your height and the type of application at hand, such as weeding in home gardens, lawns, raised platforms and farms. Some people like the longer lengths to reach under bushes or between landscaping fencing, or to reach from a wheelchair, for example. The power drill D-WeeD-R has been promoted on TV quite aggressively through home shopping networks. We have tested the D-WeeD-R and ran into problems because our drill was so fast that the weeds quickly wound around the shaft and created a messy removal situation. Perhaps a slower drill speed may work better. Many weeds were also torn off from their roots, allowing the roots to revive at a later date. The quality of steel was also poor and when the cross-pin broke, it was impossible to replace, even though a replacement was provided. If the quality were improved and a slow drill applied, this could be an effective tool. The Dandelion Terminator DLT100 is designed much like a 1-inch drill bit with a 14-inch shaft. 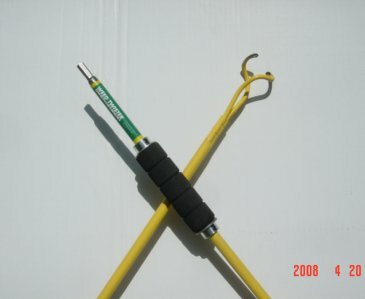 An additional 12-inch extension is also available from the manufacturer. It is not designed to remove the dandelion roots, but merely to suppress it's growth, much like mowing will accomplish. The astute shopper may wish to use a generic 1-inch drill bit with a standard extension to test the concept before purchasing this tool. The 36-inch and 42-inch drill-ready Turbo Weed Twisters by Ergonica are longer than most of their competitors and include an extra sleeve grip to provide a high level of precision and two-handed balance of weight and movement. The sleeve grip and high precision are unique to this tool design. Ergonica WEED TWISTER 36" - 60"
Stow the Hoe until you Sow! Looking for a Special Hoe ? No Free Drill: There are also several augers that drill a hole into the soil with the ability to remove any plants or roots in their paths. This includes a Weed Claw that features a blade appendage to a power-driven twisting prong. Several of these claws and twisters are illustrated on the Garden Tools page. Some questionable TV promotions offer a free drill to accompany the Awesome Auger? If it sounds too good to be true, buyer beware! Drill-powered tools require a careful match with a drill that may be costly and heavy to lug around. With a few exceptions, these tools also generally require a certain amount of stooping, based on the length of the auger bit, usually no more than 24 inches, and most are not designed to help clean up the considerable dirt and debris they leave exposed on the surface of the soil. For ergonomic considerations, look for an auger or drill powered weed twister with a minimal length of 36 inches. The Ergonica Turbo Weed Twister is designed not just to remove weeds, roots and all, but also to grab the roots in its coils for easy disposal. No basic auger can claim this root lifting and disposing feature. For doing a lot of tough weeding at the root level, such as in agriculture or land maintenance, a heavy-duty tool like the Turbo Weed Twister may be the best way to go. Several motorized weed spinning, weed spinner - twister tools on the market are designed around the paint mixer concept, a thin rod as long as 30 inches, with one or two small cross appendages that extend the radius to pull weed stems. These appendages are small because they cannot withstand a lot of torque from the spinning drill due to the material used and the way they are attached to the rod. For small weeds with shallow, thin roots, these tools may be handy especially due to their low cost. One drawback is that grasses and lengthy weed stems are likely to be severely entangled with this paint mixer type of design. The double-coiled Ergonica Weed Twister in contrast is designed to quickly eject short and long stems by reversing the rotational direction. Most other drill-powered weed augers do not provide this time-saving facility, which can be seen in the video on this page. The Ergonica tool is also made of high-grade tempered steel suitable for industrial applications, which is not true of most other motorized twisting, spinning weed removal tools of this class. Matching Drill: Select a high power (12 - 24 volts) cordless drill with a dual / variable speed and reversible option. The tougher your soil, such as with clay or dry dirt, the more power you will need. More power with less speed, such as 500 rpm or less, will make the power-weeding job much easier. A chuck size of at least 3/8-inch or 1/2-inch capacity will accommodate more durable and longer drill bits. The popular Ergonica Turbo Weed Twister ups the ante to a minimum 1/2 inch chuck (see Drill Examples below). If you can get a cordless drill with good power that also weighs less than 5 pounds, so much the better. At least 275 in./lbs. of torque will give you adequate twisting power and two batteries will allow you to keep working while charging a spent battery. Variable clutch settings allows the drill to safely stop twisting upon heavy resistance, such as when you encounter a root that is too large or you hit a rock or other solid object in the soil. This protects your auger or twister as well as your hand and wrist from excessive stress. A variable clutch and hammer drill option will also help to protect your drill from overheating in tough soil. Keyless chucks are handy and can save you a few moments when changing drill bits. Some experts assert, however, that keyed chucks give you a stronger hold on your bit than the standard keyless variety. Some hammer drills use a unique keyless SDS chuck for compatible SDS shanks. This is a special design that produces great holding power and support for hammer / percussion and impact drills. Weed augers and drill weeders do not generally come with an SDS shank, however. The Turbo Weed Twister is one of the few weed augers and drills designed with a 3/8 inch hex shank which gives strong torque support when fitted with a 1/2 inch keyed or standard keyless chuck. Drill Examples: You can see a good selection of suitable cordless drills at Ergonica Superstore with some Amazon.com comparisons. High powered cordless drills with the features outlined above are always useful, not only in your garden, but for all your other drilling, driving screws and do-it-yourself jobs around the house. Expect to pay $100 to $300 or more for a high-power, high-quality cordless drill. The 36-inch or 42-inch Ergonica Turbo Weed Twister will make a great match with any professional drill with a 1/2 inch or larger chuck. For example, several positive tests shown on video have been made with the a Makita 3-speed hammer drill, Makita model BHP451 . Compare prices for several 1/2 inch cordless drills at Amazon.com. See the Weeder Features Chart below for a convenient comparison of these weed twisters and other types of weed pullers across selected features. To twist or not to twist, that is the twister? For many gardeners, no single weeder does everything you may need to do. If you need to remove dandelions by their roots from your lawn, you may chose one of the precise weed twisters or other lawn weeders that are not of the hoe-blade type. If you need to remove smaller weeds efficiently from larger areas, you may pick from several of the hoe-type tools or the multitasking Ergonica Weed Twister. If you need to do both, as do most gardeners, you may select two or three tools that best match the weeds and circumstances in your garden as well as the way you like to work. Some people enjoy collecting a variety of unique gardening tools for weeding and other purposes. New garden tools are fun, but also require a bit of experimentation and study to get the best use of each tool. The best use advice for the Ergonica Weed Twister, for example, is provided on the Weed Twister website. Are you ready to stop pulling and start twisting? In addition to the eight major classes of weeding tools identified in the Tool Terrain Hierarchy, each tool has different features as we have defined for ergonomics, for example, back-saving or short-handled, or levels of precision. You can also further distinguish tools by price, and weight and whether available on the web or in your local retail stores, and so on. We have taken some of these features and made a chart to show how a variety of tools measure up respectively. If you are a serious shopper, you can also make your own spreadsheet and add any features that are important to you. The great variety of weeding tools available show more creative ingenuity and diversity than possibly any other category of hand tools. This is no doubt a reflection of the great variety of weed shapes and sizes and the different types of situations in which these misplaced plants are found. It is also a reflection of the preferences we each have for either using power tools or no power tools, for example. Likewise, some people prefer complex tools with moving parts, whereas others prefer simple tools with no moving parts, an elegant solution. If you have back pains or arthritis, for example, your body may tell you which types of tools to select. If you're buying tools for a farm or land management operation, you need to look for industrial grade tools that match the vegetation and terrain in your region. A responsible employer will also look after the safety of workers in the fields by equipping them with ergonomic tools. After all, even with the best equipment, spending hours a day in the sun pulling weeds is no picnic! Still in development there are several robotic weed removers for large fields and agricuture and possibly a Roomba for your home garden. As stated above: Different weeders for different weeds! How many different types of saws do you have in your tool shed? How about screw drivers? How about shovels or pruners, for example? Does one pruning tool handle all your needs? Probably not. There's no single weeder that can claim to handle all types, sizes and shapes of weeds, either! We offer the Eight Major Weeder Tool Classes and Weeder Features Chart to help you zero in on a few of the types of tools you need to make your life in the midst of weeds a little easier. If you're a professional weed maintenance specialist, land manager or farmer, this may be a good time to get serious and get smart about appropriate tool selection. You may consider testing a careful selection of new tools to see which ones help you the most. Our old traditional tools may still have a place in our garden while we try out new tools and new methods of gardening, such as organic or polyculture methods. You will find one of the largest selection of all types of weeders, mulches and chemicals, including organic herbicides, for review or purchase on the Garden Tools page. Awesome Auger Video Yes Yes Yes Yes Yes No $30 14"-36" Yes D Twister - Split Disk element - extends to 36" - Drill not included! Looking for a Special Hoe, Weeder, Weeding Tool, Cordless Drill , Earth Auger ? See many of these and alternative tools on the Garden Tools page! By downloading this chart you can study it at a more convenient time and edit the list to add and compare other tools of interest. You can also add additional columns to compare other features such as dimensions, weight, shipping charges and taxes that are offered by various vendors. Do your homework to make a selection of one or more tools for your home, garden club, company or farm. Simply click on the Download link above and OPEN or SAVE as a Microsoft Excel spreadsheet on your PC disk. This is a free download to help you with your weeding tool purchase evaluation. Clearly, there are many good choices to help you do the job of weeding. Your weeding tool arsenal may need several new tools for weeds of various sizes and shapes. If you're narrowing down your selection to two or three choices, such as a weed twister and a special hoe, for example, you can examine the web site for each tool using the links on the Weeder Features Chart above or the Garden Tools page. Perhaps your choices may include one or more Ergonica Weed Twisters of different sizes, because you have little time to spare and need it's multitasking capabilities. You may also select other twisters or pullers with certain features that match your needs and preferences. With two or three well-chosen hand tools, your most stubborn weeds will finally meet their match. But don't throw away your old wide-blade hoe just yet. If you sharpen it up a bit, it may still come in handy at times! And don't forget, buying cool tools is the fun part! Make sure you also allow yourself enough time to twist or rip those weeds before they block your path! What are the pros and cons of using a traditional wide-blade hoe for weeding? Name three weeding tools that are suitable for removing dandelions from lawns? What kinds of weeding tools should you be looking for in Organic gardening or sustainable agriculture? Are short-handled tools necessary for precise weeding? What kind of drill should you use to power a weed removing auger or claw? Which of the Weeding Tool Terrains applies to grassy weeds like crabgrass? Name three weed species that cannot be removed effectively by the Ergonica Weed Twister and explain why each is included? Why do some people use herbicides instead of hand tools for weeding? What are the main reasons why weeds may repeatedly return to the same place? Is there any one hand tool that can solve all weed removal problems?